Received June 12th, 2010; revised August 28th, 2010; accepted October 7th, 2010.
tern to ensure the development of China’s economy. 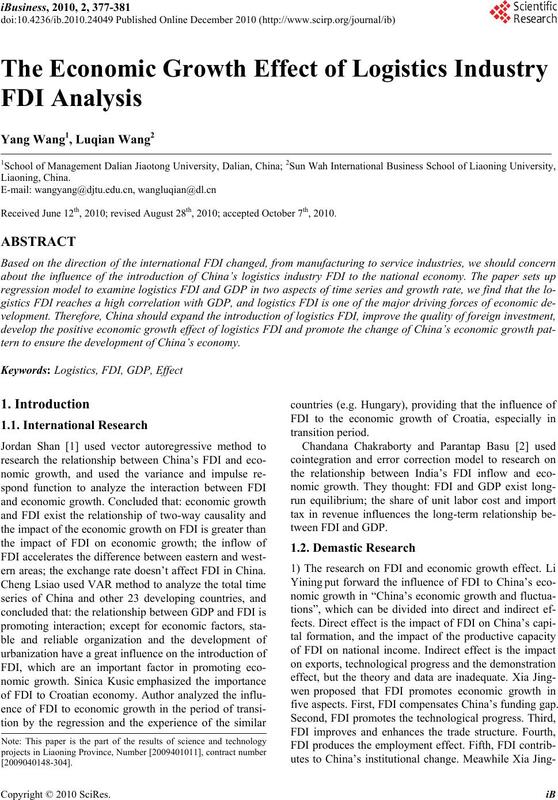 ern areas; the exchange rate doesn’t affect FDI in China. five aspects. First, FDI compensates China’s funding gap. and the main problems of using FDI. progress and economic growth to developing countries. to analyze (see Table 1). quantitative analysis to research the relationship of both. Table 1. 1997-2007 China’s GDP and transport industry FDI. 39757.38 + 0.91X (Table 2). 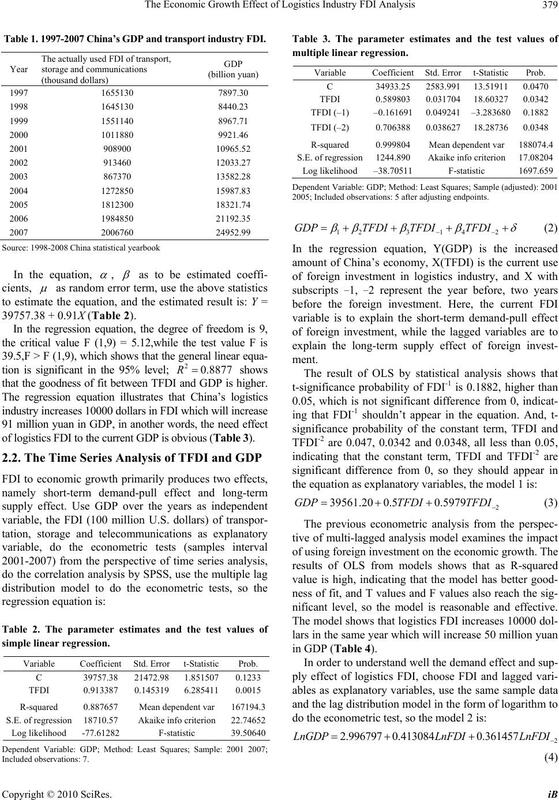 that the goodness of fit between TFDI and GDP is higher. of logistics FDI to the current GDP is obvious (Table 3). 2005; Included observations: 5 after adjusting endpoints. nificant level, so the model is reasonable and effective. multiple linear regression model 1.
multiple linear regression model 2.
justed): 1997 2004; Included observations: 5 after adjusting endpoints. the independent variable (GDP),with the overall linear. on logistics FDI (Table 5). Table 6. 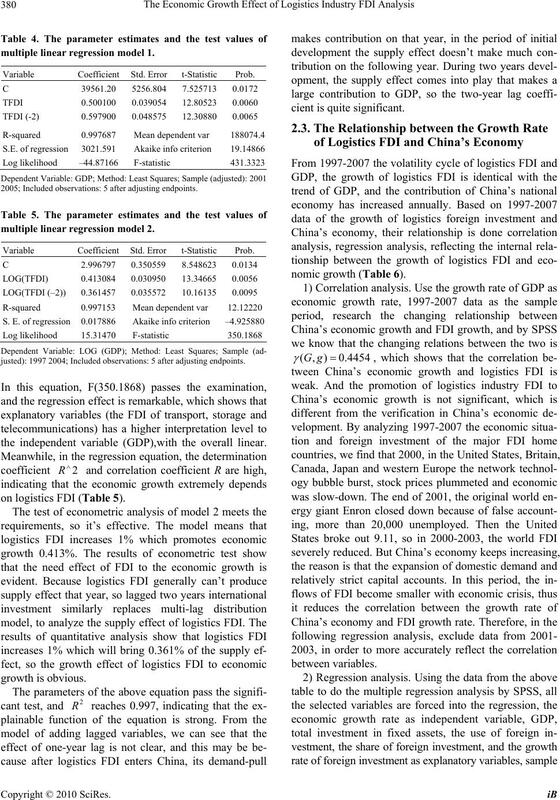 1997-2007 the growth rate of China’s economy and the related factors of logistics industry. 1 Narional data center; other data from 1998-2008 “China statistical yearbook”. Table 7. The parameter estimates and the test values of multiple linear regression model. 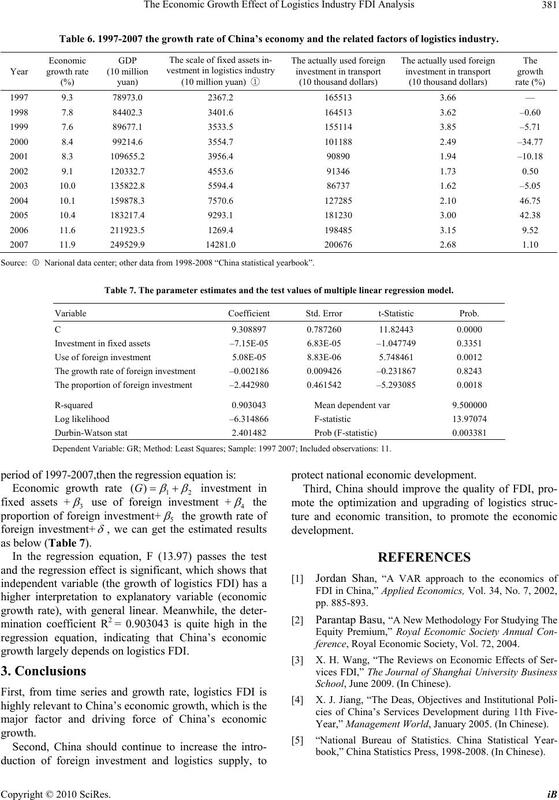 Dependent Variable: GR; Method: Least Squares; Sample: 1997 2007; Included observations: 11.
growth largely depends on logistics FDI. ference, Royal Economic Society, Vol. 72, 2004. School, June 2009. (In Chinese). Year,” Management World, January 2005. (In Chinese). 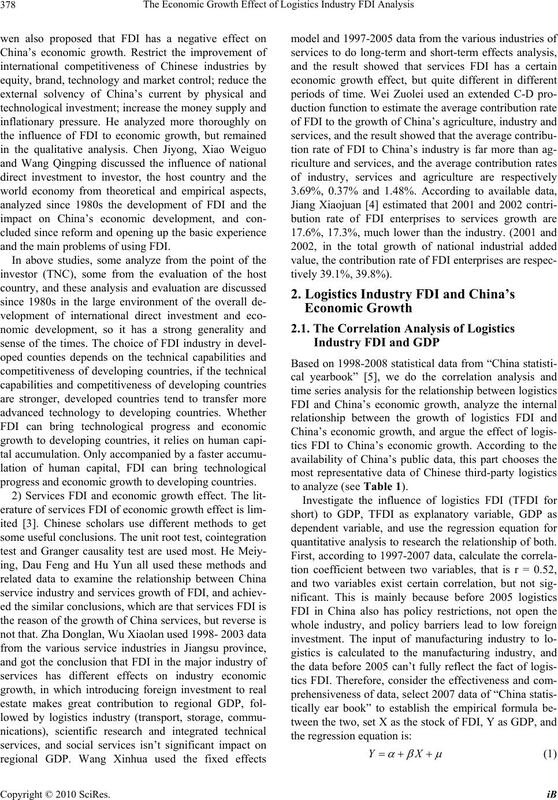 book,” China Statistics Press, 1998-2008. (In Chinese).